After great success for the Beta RR Enduro Racing bike on racetracks in 2014, with it snatching the top two positions in the World Enduro Championship, EJ class, with Danny McCanney and Giacomo Redondi, and third place in the E2 class with Johnny Aubert, as well as first place in the World Indoor Enduro Championship, EJ class, with Giacomo Redondi, the Tuscan manufacturer has produced a limited run of "race-ready" Enduro bikes. 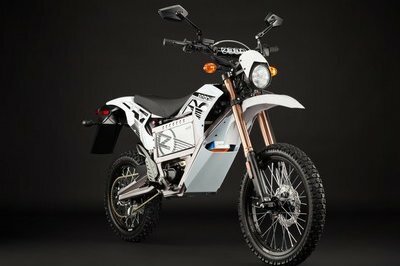 The RR Racing bikes derive directly from the bikes used by the official riders during the challenging World Championships and are aimed at riders seeking maximum performance even in the most extreme racing conditions. 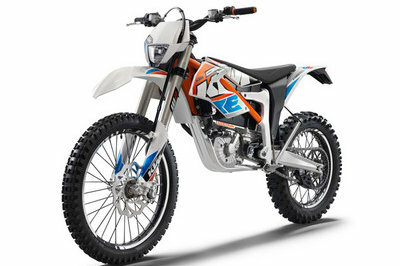 The RR Enduro Racing MY 2015 will be available with the following engine sizes: 250 - 300 2T and 350 - 430 - 480 4T. 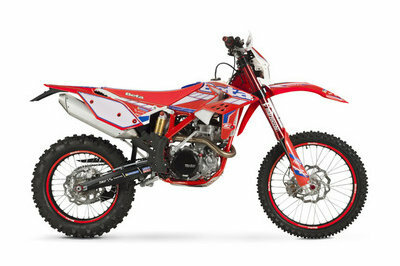 Continue reading for more information on the 2015 Beta RR 430 4T Racing. •	Marzocchi USD ?48 fork complete with pressurised cartridge with PFP system for rapid and optimum adjustment. The exclusive PFP system lets the rider manually change the pre-load of the balancer spring by loosening or tightening the regulator. 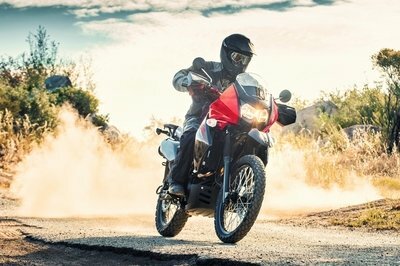 This results in greater responsiveness from the fork, allowing the rider to travel over all types of terrain (hard, soft, sandy or stony) without having to change its calibration. It is fitted with low-friction compression rings, offering a smoother ride with the strength and lifespan of traditional rings. 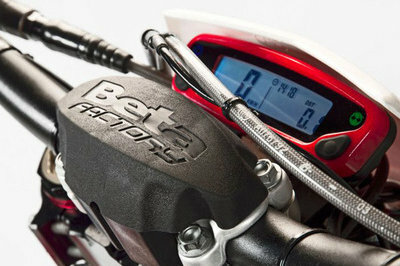 Calibrations have been updated and developed and are specially tuned for the 2T and 4T; the result of a long project carried out by the Beta Enduro Factory Team, in which riders defined specifications with which to obtain more precise riding and increased control, especially in the most extreme conditions. Equipped with black anodized plates for a "racing" look. 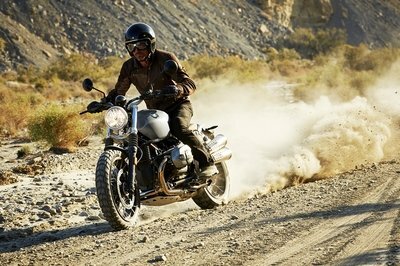 •	ECU with double mapping and a switch on the handlebars, to be able to change quickly from a "soft" regulation, ensuring better traction on slippery surfaces, to a hard regulation, for optimum power delivery on dry ground. •	Quick release front wheel pin. This speeds up tyre-repair operations, helping to save precious seconds during races. 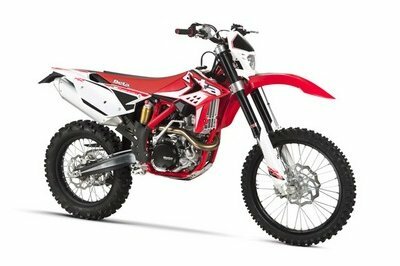 •	RR 4T Vertigo handguards, with an aluminium bracket, modern design, solid structure and "in-mould" graphics, are ideal for extreme off-road riding. •	Footrests in black, lightweight and sturdy Ergal have a larger rest surface and steel pegs to ensure maximum grip in all conditions and a long lifespan. •	Red Ergal chain tensioners are stronger and feature a racing design. •	A racing seat with document compartment. •	Black anodized gear level and rear brake lever. •	Chain tensioners, gear oil cap, engine oil cap and racing-oil filter cap: the lightness of aluminium combined with the aesthetic impact of red anodization. Pure factory look. •	Racing graphics and red wheel stickers. Solely for the 4T version, the RR Racing bike will use a new frame derived from the racing department, with main crossbars increased to rectangular sections in Chrome-Moly steel, obtained through comprehensive research aimed at optimising rigidity according to the various axles, and a micro-fused shock joint. This means greater riding stability and precision. Cooling system capacity 1,3 l.